Preview(s) : Where are displayed files scanned. (Left mouse click shows video in BigDisplay, Right Mouse click opens previews options). BigDisplay : Where are displayed previews when (left) clicked. TreeView :TreeView (where are displayed drives and directories). You have to select source(s) by clicking boxes. 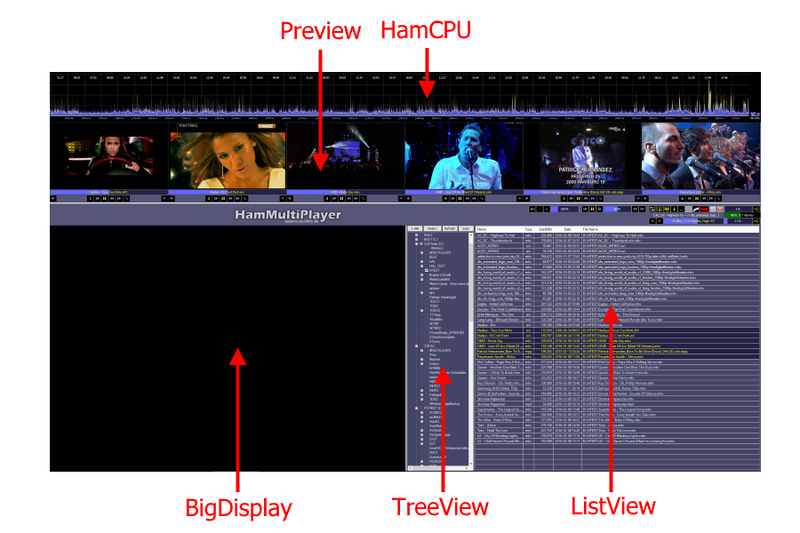 HamCPU : Displays CPU activity (must be activated in preferences and can be set to Top or Bottom of screen). Display Modes : (a very important feature) to switch between 4 HamMultiPlayer Modes (Default, Dual, ListView or FullWidth). Multi-Display mode : Usefull if you've several monitors and wish to display thumbnails on another one. You can use a total of three monitors (one for main interface, one for thumbnails and one more for external player). Wall Display : Lefts you create a wall using several previews. Information : The first Window displaying Informations when starting HamMultiPlayer. Get Additional Details : Once scan is complete, select this button to get additional details of all files. Preferences : to configure HamMultiPlayer as you like. Stop : Stops all previews (process), resets Interframe settings, etc... Click again and HamMultiPlayer reloads previews without special settings. Minimize : Same as Window minimize. Quit : Exit HamMultiPlayer closing any process. 2°) Page selector (HamMultiPlayer manages files by page. Each page = Number of previews). - Click this gauge to move to a particular page. From Left to Right : Reload from start / Play or Pause / Play one frame / Global position (click to move all previews) / Rewind / FastForward. 4°) Big Display Move : These controls only affect Big Displayed previews position. 5°) Previews Speed : Changes previews speed. 6°) Big Display Speed : Changes Big display speed. 7°) Move to page... : Decrease or increase page number. 8°) Scan : Once you seleted sources directories, click this button to start. 9°) Refresh drive list : Refresh drives list (if for example you just added a USB key...). 10°) History of scans you already made (see this post). 11°) Default Big Display Ratio : Sets Big Display to a specific size. Not that moving vertical bar is another way to resize display. 12°) Memory Display : HamMultiPlayer can use a lot of memory, have a look to this gauge to check your memory usage. 13°) Previews volume : This only affects previews, not Big Displayed movie. 14°) Big Display volume : Only affects Big Displayed movie. 1°) Swaps between Single and Multiple mode : (Single mode displays one movie over all previews, Multiple mode displays one movie per preview). 2°) Gauge displaying filename and preview position. You can use mouse click or mouse wheel over that control to move current preview position. 3°) Preview number : Clicking this button lets you access current preview "quick options" => See second picture. When your mouse is over, it displayes informations about current file. 4°) Reload from start : Stop current process and reload from start. 5°) Play / Pause current preview. 8°) Created Thumbnails view from current preview. 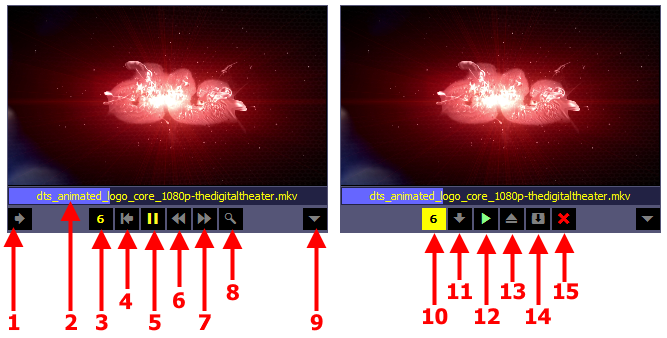 9°) Swaps to DualView displaying two previews at same time. Ex : Clicking number 5 will display previews 5 and 6 side by side. 10°) Click again to exit "Quick options" (return). 11°) Move To : Lets you select destination directory to move current file... Each time you select a new path, it's added to this list... This is a fast way to move file ! 12°) Play current preview using an external player (has to be defined en preferences). 13°) Stop process, unload and access current file (opening a windows to locate its position). 15°) Delete file. Warning ! One of the slowest thing in HamMultiPlayer is drives/directories selection before scanning. Many users told me that it was boring to always (re)select paths when starting ! Then i have decided to create a faster way for selection. History Scans Management lets you "recall" previous scans selections. First time you start HamMultiPlayer, "History" button is disabled (no history). Every scan will be saved inside a file called HMP_History.ini (stored in your system inside : %temp%\HAM ). This is a new option of v0.115. Files : Number of files found. Paths : Number of available paths / number of scanned paths last time. 1/2 means => 1 path available over 2 found last time. Color is Orange, that means path availability is partial. 0/1 means => 0 path available over 1 found last time. Color is Red, that means path or drive has been removed. 1/1 means => all paths are available. Color is white. Clear List : Delete History file. Delete Scan Item : Remove one line from history. Load selected path : Get paths and add them to treeview. AutoScan : Will start scanning/loading without waiting. Cancel : Close this window. - Duplicates are removed and only newer is kept (displayed on top of list). - If you wish to recall an history and adding selection before scanning, uncheck AutoScan.